Journey to the group of islands known as the Philippines and you'll most likely never be far from a shark whether you're in the water or on land, as many don't fear shallow water. These cartilaginous fish support themselves utilizing keen senses of smell, sight and hearing. More than 400 species roam the world, with more than 150 common in the watery tropical paradise in southeast Asia known as the Philippines. 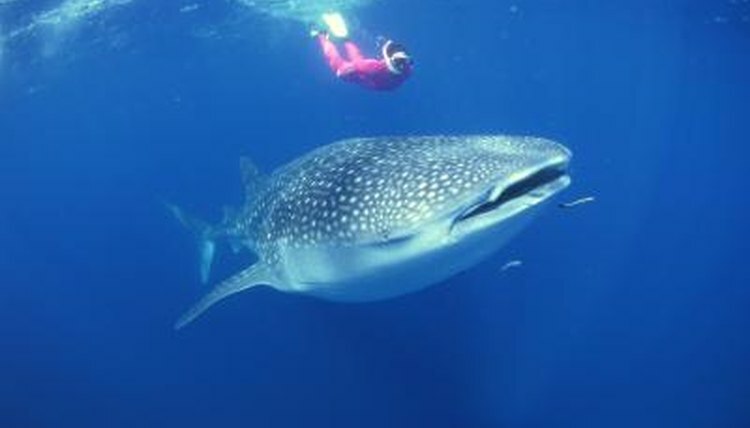 Whale sharks feed on plankton in Donsol Bay from November through June. Reaching dramatic lengths of more than 40 feet and weighing more than 20 tons, the whale shark is the largest of all shark species. Professional tour companies help you swim safely with the spotted grey beauties with the aid of basic snorkeling equipment. Other large shark species that swim the waters around the islands include the great white shark, which can exceed 20 feet long, and the blue shark at about 14 feet. When you overhear a lively discussion about inflatable sharks in the Philippines, chances are the conversation has nothing to do with a children's pool toy. The 2-foot-long shark feeds on shrimp, inflating its belly with water to increase his size and discourage predators. The sharks are but one of 43 species new to science that are found in the Philippines. You'll find other unusual sharks as well, such as the hammerhead and the giant guitarfish. Some of the most dangerous sharks in the world roam the waters of the more than 7,000 islands in the Philippines. Bull sharks are considered the most dangerous, swimming in water less than 100 feet deep and commonly found in fresh water rivers and estuaries. The bull sharks often hunt in pairs and will attack without provocation, including attacking humans who enter their territory. Other species to watch out for are great white, tiger, oceanic whitetip, shortfin mako, grey reef and blue sharks. Whitetip reef sharks top the list of most commonly caught sharks in the country followed by the spurdog squalus megalops. Other populous species include tiger sharks, silvertip sharks, blacktip sharks, brownbanded bamboo sharks, white-spotted shovel nosed rays and sharptooth lemon sharks. Lying along the equator, the tropical waters around the Philippines straddle sharks' migratory routes, making it possible to find a plethora of shark species within its boundaries. Tree Hugger: 10 Amazing but Endangered Shark Species: How Many Do You Know? When Do Angelfish Eggs Hatch?